A quick yet informative book about how Amazon Echo will Save you Time, Money & Double your Productivity! Are you a busy individual who struggles to find enough time to perform certain basic tasks, whether it is around the house or office? If so, then you need to learn how to use the Amazon Echo to lighten your load. 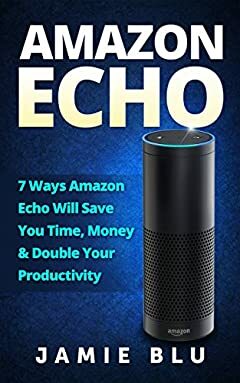 In this book, Amazon Echo: 7 Ways Amazon Echo will Save you Time, Money and Double your Productivity you will learn just how effective it is to use this device to make your life so much easier. You may be aware of what the Amazon Echo is and how it works, but most people havenâ€™t really discovered the simple ways that it can save them time, money, and increase their productivity. The Amazon Echo provides you with a myriad of benefits. It is more than just a music player to enjoy some soothing sounds with. It is more than just a way of storing your To-Do lists. There are many different ways that someone who lives a busy lifestyle can make maximum use of the Echo. The truth is that people are always looking out for new ways to save their time. Letâ€™s face it; todayâ€™s world is moving at the speed of light and you need to find a way to squeeze in all the important stuff you have to do within the same 24 hours as everybody else. Time is a precious resource and you need to protect it. Once it is gone, it is gone for good. There are some really good ways to maximize your time by using the Amazon Echo. Life is not getting any cheaper either. We are all on the hunt for ways to keep costs down, and if there is technology out there that can minimize your spending, then you need to have it. People are paid to be productive, and if you want to stay that way, then you need to make efficiency the cornerstone of your life. The technology that Amazon Echo runs on is designed to do everything that you want it to, from booking appointments to keeping up with social contacts. Amazon Echo can be all you want it to be and more. That is why you need to read this book. You will learn how to make the best and most efficient use of this evolving technology so that you can stay as effective and productive as possible. No matter how busy you think your life has become, the Amazon Echo can help you make things run smoother than ever before. Letâ€™s get started! Tags: Alexa Skills Kit, digital devices, smart device, beginners guide, personal control, Amazon Echo, time management, business device, to-do lists, audiobooks, user manual, users guide, amazon benefits, voice command device, amazon device, tips and tricks, troubleshooting Issues, home devices, alexa, alexa kit, Guide for Beginners, Alexa Voice Service, electronics.